Zentech Ecoboard is a new product to North America which is a cement wood fiber board. It consists of cement powder, wood shaving and epoxy. It comes in a 4x8 sheet and different thicknesses. Currently it is being used around the world such as UK, Sweden, and some part in Asia (Japan, Taiwan, Korea, and Thailand). The primary use for this product is for interior decorative purpose. It can also be used for exterior (see manufacturers recommendation and installation manual for outdoor application). For installation, end users and contractors should follow manufacturers installation manual and recommendations. 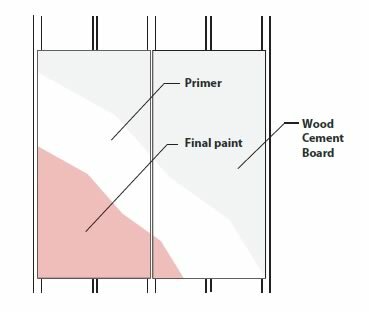 For exterior use, cement board manufacturers recommend coating the boards with colour acrylic paint before installation to ensure longevity even though wood cement board is weather resistant. To protect from exposure to sunlight, UV protective paint must be use. Without paint, surface quality changes over time and flake may swell. Also boards are affected more by temperature and moisture changes. This leads to higher shrinkage and expansion. The higher shrinkage and expansion issue can be solved by using thicker board to lessen moisture movement and using lighter gauge steel frame to allow more movement. This ensures that boards do not crack at fixing points. If boards are fixed on wooden frame, there is no issue with crack from moisture movement. For better absorbent with paint or any other surface protectant it needs to be dust off and or lightly sanded. This document is to serves and supports our clients, end users and contractors. If there is any other questions about the product please contact us for assistance. The major advantage of Wood Cement Board is it can be easily to work with normal wood working machine. Follow these installation tips to work professionally with the board. CUTTING: This can be done easily by using a hand-saw or an electronics saw. We recommended to use a diamond cutter minimum 4 inch diameter apply with 30-60 m/s rotational speed. To ﬁnishing the edge, use simply sand paper. BORING: Recommend to use electronic hand-held drill with electronic rotation speed control for manual boring. It is necessary to bored from the back side of the board to avoid the damages of front surface. 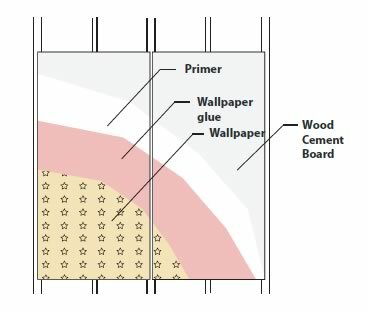 MILLING: Wood Cement Board can be milled by using regular milling machine as mentioned above. When milling the board, the appropriated rotational speed is vary from 25 - 35 m/s. GRINDING: Grinding surface of Wood Cement Board is to reduce the thickness tolerance for ﬂooring applications. Electric hand-held grinding tools with abrasive paper of 45-80 granularity can be used. DRILLING: Wood Cement Board can be drill by using Hi-Speed boring bit bit. We recommended to drill from the back side of board to guard the decorated surface. 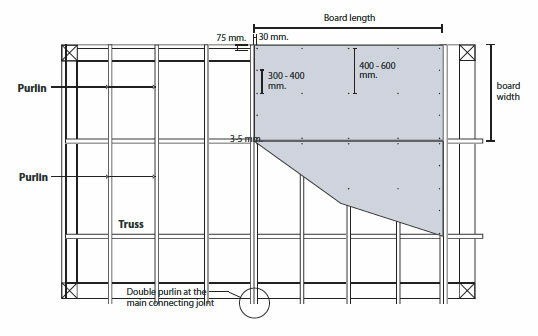 HAMMERING: For the board thicker than 10 mm, recommend to pre-boring before hammering into the board. In case of using timber frame, air-stapling is recommended. Screw through timber frame, recommend to use screw with 4.2 diameter and 35-55 mm length in both horizontal and vertical used. 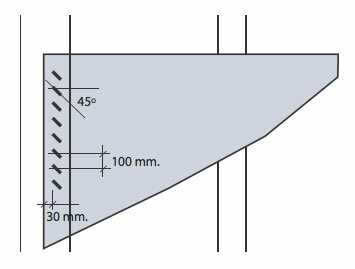 Screw should be ﬂushed into timber frame at least 2/3 mm of its length. Screw through steel frame, recommend to use screw with 3.9 diameter and 22-33 mm length. 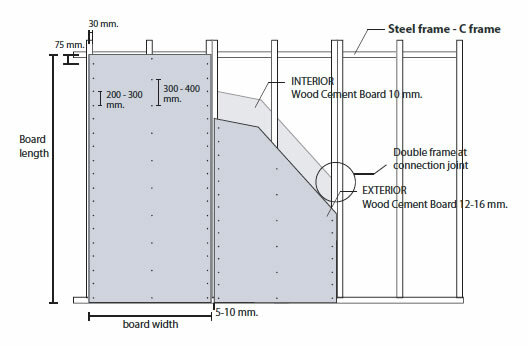 The pre-boring is required for Wood Cement Board more than 12 mm thick. STAPLING: Wood Cement Board can be ﬁxed by using air-stapling machine. The maximum thickness to be xed by stapling is 12mm. 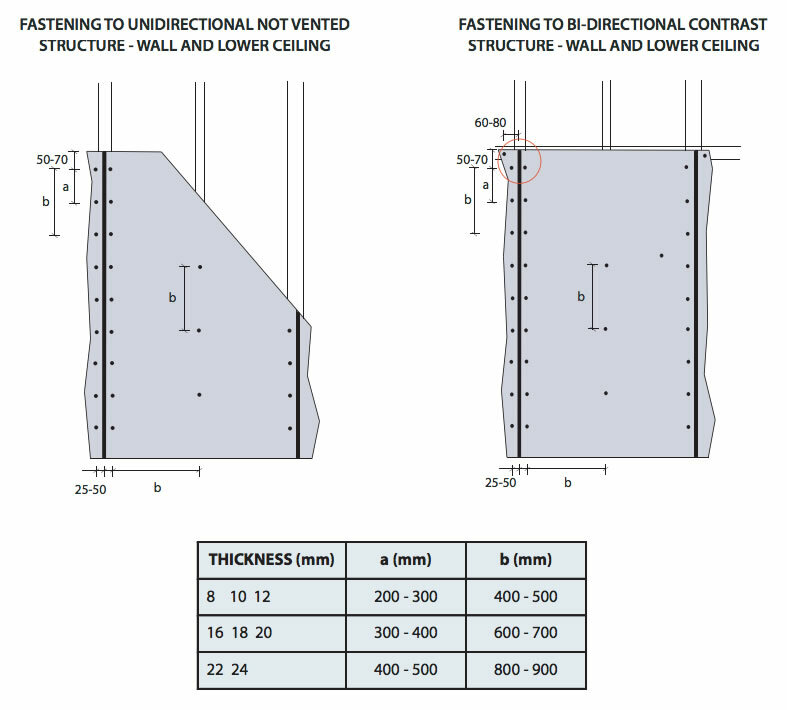 with the vertical direction only, light wall partition is recommended. Flooring, roof deck, and ceiling application should be avoided to ﬁxed by stapling. Standard Joint: While installation, users should dilate space 5 - 10 mm wide and ﬁll up with Poly-Urethane mastic material white or grey color. To save the cost of jointing ﬁlter, recommend to use backing rod before jointing. V-Joint: This system is suite for internal used with no use of elastic material or poly urethane. The joint is 10-12 mm wide and 5-7 mm depth. Mill Joint: This system is helps to hide out the jointing area. The area of the joint will be mill out 30 - 40 mm. each board and dilate space 1 mm wide for jointing area. Then apply the elastic material and put the micro ﬁbrous web 61mm wide. The top layer is coat by using elastic material and leave it for 45 minutes our until it is dry. Then sand the surface by using abrasive paper no. 2 or 3 for ﬁnishing process. COATING AND PAINTING: Wood Cement Board can be coat by using lacquer, polyurethane, or silicone and also show the surface of the board. If users plan to use Wood Cement Board in humid area, we recommend painted lamination method to protect the board from humidity. Then, paint with acrylic, water base, or solvent color. The board should not be painted when it is wet or oily. To prevent warping of the board, in the area that has too much difference temperature between the front and the back of board, should apply contact primer for both side. WALLPAPERING: Firstly, coat the surface of Wood Cement Board with primer and applies wallpaper glue to attach the wallpaper to the board. The wallpaper should be high flexibility to avoid tolerance effects. Wallpaper can be spread across the dilatation joint. 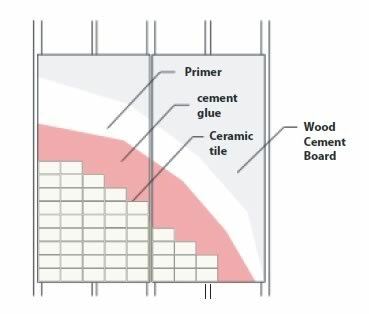 COVER BY CERAMIC: Firstly, coat the surface of Wood Cement Board with primer and applies gluing mastic for instance, cement glue or ceramic glue. Then top with ceramic tiles and be aware of dilatation joint, ceramic tile should not spread across the joint between each board. Span Not more than 60 cm. 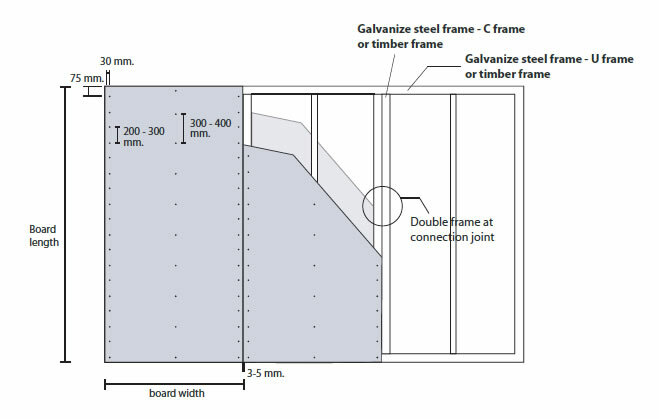 Recommended to use double frame on the connection joint. Fastening Screw 35 mm length for galvanize steel frame and 1 inch length for timber frame. Pre-boring is recommended. Then, Laying the board begins with the whole board in the corner along with frame. The distance to be fastened by screw in shown in the picture. Surface treatment Coating / painting / wallpapering / ceramic / etc. Span Not more than 60 cm. 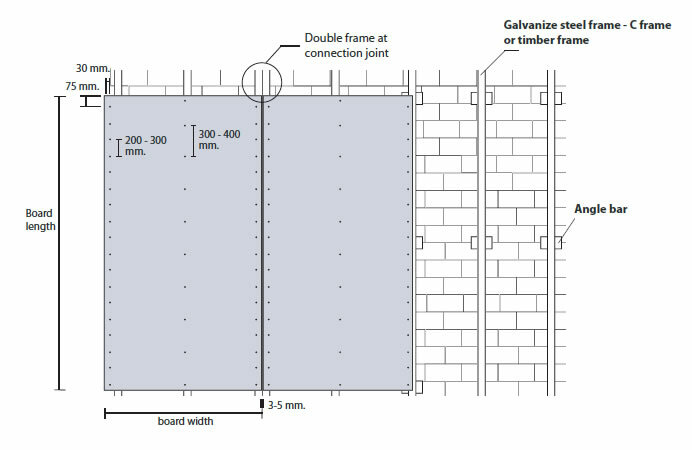 Recommended to use double or single frame on the connection joint. Fastening Screw 35 mm length for steel frame. Pre-boring is recommended. Then, laying the board begins with the whole board in the corner along with frame. The distance to be fastened by screw in shown in the picture. Covering Attach ceramic tile with high flexible cement glue. 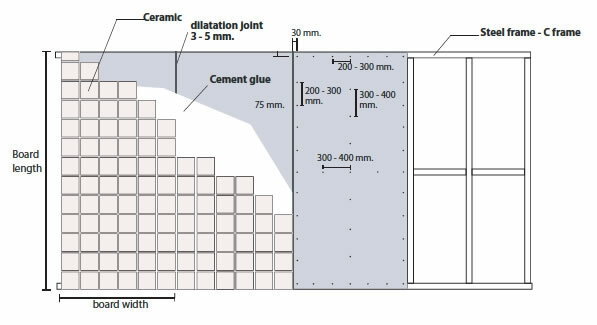 Then, seal the jointing of ceramic along the dilatation joint of cement board with high flexibility material. We recommend not to attach ceramic across the dilatation joint of board. Span Vertical 40 - 60 cm. Fastening Screw 35 mm length for Steel frame with Wood Cement Board 12 mm thick and 45 mm length for Wood Cement Board 16 mm thick. Pre-boring is recommended. Then, Laying the board begins with the whole board in the corner along with frame. The distance to be fastened by screw in shown in the picture. Surface treatment Coating with primer, double layer is recommended. Follow with acrylic color. Double purlin on the main connection joint. Fastening Fasten along purlin. The distance to be fastened by screw in shown in the picture. Surface treatment Coating / painting / ceramic / etc.